- DIY clothes rack installed to fit in all sorts of spaces, allowing bulk storage of clothing. - Installation possible without any tools. - Side width adjustment allows installation in narrow spaces. 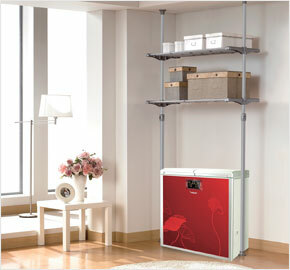 - Height adjustment allows perfect installation in houses with high walls. - Tightening control valves for easy installation, and strong steel pipes assure loads up to 80kg. - Ceiling spring stand and slip-prevention rubber board assures sure, strong fixation. Copyright 2014 LIVING STAR All rights reserved.